Heinz Favourite foodie challenge, Part 4: “Burgermania”! 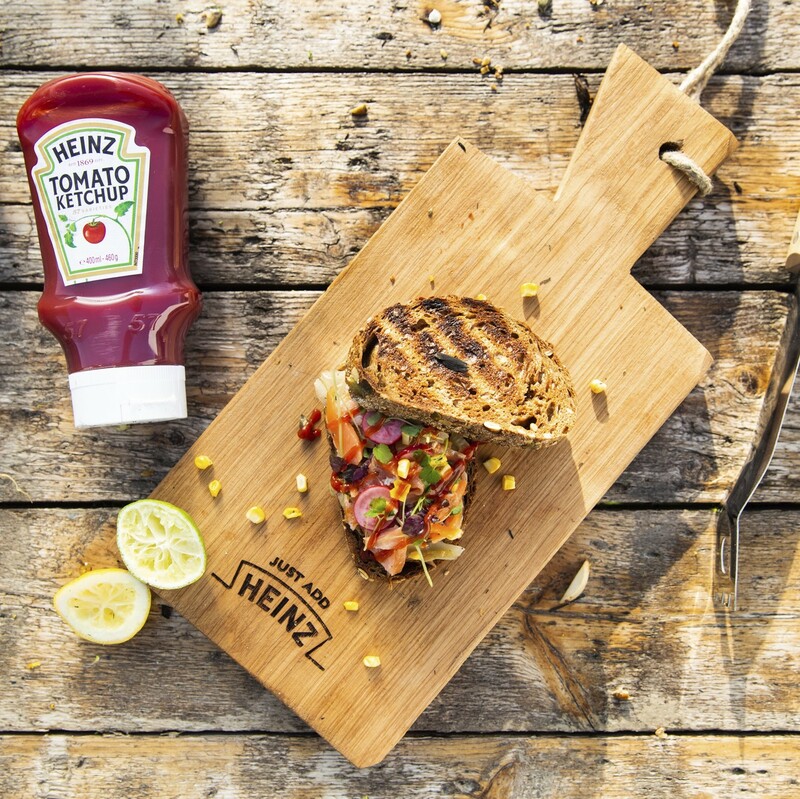 Make a creative Burger using Heinz Ketchup as a topping! Everything’s possible as long as you’re creative with these ingredients. Make it something original, you have 40 minutes time preparing the meal! Good luck!”. Sounds like an insane project. Especially when the BBQ you need to make this burgers on is simply crap… No time to waste! This BBQ won’t get hot so I avoided meat and went for salmon! This was probably the most challenging task in the contest. Yet this “Salmon Burger” can be considered as a bit of a price winning recipe? A bit? Yes indeed! Read on to find more about it! To be honest! I’ve stretched the limit’s of the term “Burger” for this challenge. Yet in case of time restrictions one needs to get creative with terms and conditions. Bringing a toast instead of a burger bun and salmon flakes instead of a patty, I ended up with a delicious Burgerlike Sandwich. If I had known the sandwich would be another task I would have reconsidered this idea! Yet I have no regret at all. Forming a Patty without the right tools and ingredients would be impossible in that time limit. Besides, using meat on a BBQ that remains far below grilling point would be tricky when using meat. What better product to smoke slowly than salmon! It’s awesome tasting and surprising as a burger thought! And the judge on duty agreed! “The most surprising burger out of five is for sure this one!” But was it enough to win? The answer on the questions mentioned above is dubious. Depending on how you look at things. But we’ll get to that part in a moment! First I need to admit I failed in the process of smoking the salmon. The lack of a decent lid made me think of a secundary solution. I’ve put a cast Iron skillet on top of the salmon as a lid, hoping to catch some smoke taste with wood chips and thyme and rosemary. Hugo Kennis noticed my attempt and stated I failed on this part! The salmon was perfectly cooked but no smoke taste. This costing me a minus point leading to the 9- score on ten. Probably I wouldn’t have got the minus when I didn’t even try to smoke. Yet I did and even though it cost me something I’m glad I’ve tried. A big hit for “24 kitchen judge” Hugo Kennis who stated the burned fennel is one of his favorite ingredients! A surprising addition to the burger and brought to taste in a delicious manner. After blackening the fennel in between the coals (caveman style) and removing the outer burned leaves, you’ll end up with a delicious sweet tasting anise flavour. Combined with the acidity of citrus juices (lime, lemon and orange) and freshly pickled radishes they boost the salmon to a higher level. For the looks and additional taste I used some lovely herbs available. Being the atsina cress and purple shiso. The first bringing a sweeter fresh anise taste to accentuate the fennel and the second one bringing a fresh herby flavor (think of a light version of cumin). And finished with a touch of Heinz Ketchup! I was a bit worried the idea of combining these ingredients with ketchup would be ruined! Yet when used in a subtle way the ketchup is truly supporting the other ingredients! However the minor smokey mistake “Hugo Kennis” was pleasantly surprised. Did someone get a higher score? No… Did I win? Yes and … Eum … No?? I’ve received a 9-, yet my fellow blogging partner in the contest “Foodblabla” made a burger worth a 9 (no minus here…). So both the same score yet ranked somewhat higher? Is this a price winning burger after all? Yes if you ask me :p. Why simply because it tasted damned good after three days of shooting in blazing hot temperatures! I truly enjoyed eating this salmon burger. Hope you like it as much as I did! Btw If you can’t find the cresses don’t worry! They are optional! Yet worth looking for! They add a subtle taste and a lot of good looks! Are you curious for the recipe of this delicious salmon burger? Don’t hesitate to make it yourself! It’s not the easiest recipe! Yet worth the effort! Oh and if you want to do me a favour, please go over to this post on instagram and leave a comment for me (@the_bbq_bastard). This way you can give me a vote and help me a step further on winning the Heinz favourite foodie challenge! Thanks in advance! Grtz, Simon. A delicious bun, a juicy piece of meat and some creative toppings! That's what a burger needs! But this Burger 2.0 can use something extra! No cheap bun or dry burger! But a delicious toast with smoked salmon and burned fennel. Honestly! This is more a sandwich than a burger since no patty is involved! Find out why in the post above! After all this is a price taker! Mingle the sunflower oil with the juice of a half lime, lime zeste, cumin seeds, dried sage, salt and pepper. Put the salm in this marinade and rub the spices thoroughly in the filet. Divide your BBQ in 2 heatzones by placing the coals on one side of your Q. This way you'll create a hot and a medium heat zone. Put the fennel and corn on the cob in between the coals until the outer leaves are completely burned. Don't worry, you'll remove these burned pieces afterwards! This proces will lead to a majestic taste in your corn and fennel. Put the salmon skin side down on the low heat zone of your BBQ. Add the thyme and rosemary together with the woodchips to the coals and smoke the salmon until done! When possible use a lid to catch the smoke! While the salmon is smoking you can start slicing the radishes thinly. Add them to the sherry vinegar and put aside. The salmon is ready when the flakes start to fall apart when gently pushing it. Let rest for a couple of minutes. Meanwhile remove the burned leaves from the corn and fennel. The blackened fennel will be deliciously sweet and anise tasting. Slice it thinly and bring to flavor with the citrus juices (lime lemon and orange). Taste and add some extra ingredients, salt and pepper at taste. The fennel taste shouldn't get lost in the acidity of the citrus flavors. Oil the slices of bread and toast them golden brown. Add a layer of burned fennel salad. Put the salmon flakes on top and finish with pickled radishes and pieces of grilled corn. Toast the slices of bread Toast je broodjes tot ze mooi krokant zijn en leg een laagje van de gebrande venkel op het onderste broodje. Voeg enkele flakes gerookte zalm toe en enkele schijfjes gepekelde radijs. Snij enkele korrels mais van de kolf en leg op de zalm. 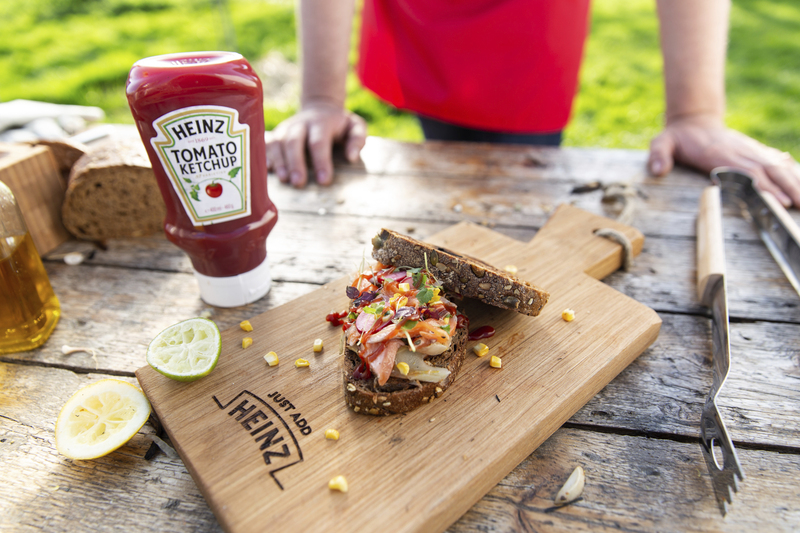 Spuit er wat Heinz ketchup over naar smaak zonder dat de ketchup gaat overheersen (wees ook niet te zuinig want de ketchup is een lekkere aanvulling (zie foto)). Add some ketchup at taste without losing the flavour of the salmon and fennel! But don't be to eager too! It's a nice addition when used properly (see picture). Finish with some leaves of atsina cress and purple shiso. These herbs are optional but lead to a royal extra flavor and looks!! But you need to find them! Serve with love and have a nice meal! Peach liquor carrots – Surprising sides!